This infographic poster is illustrated with 64 distinctive guitars from rock history. This chart-topping infographic will have you rocking out to 75 years of guitar history. 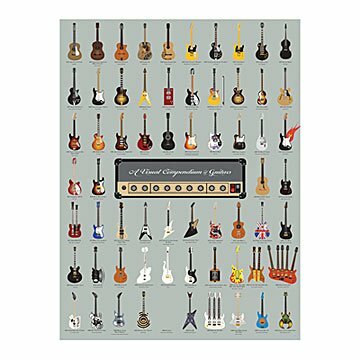 It features illustrations of 64 distinctive guitars, each labeled with its make and model, and the name of its player. They range from the classic contours of the guitar played by blues legend Leadbelly, up through insect-like ax used in the metal band Gwar. Any rock lover will be endlessly fascinated by the unique silhouette and decoration of each piece. Printed using vegetable-based ink on 100-pound, FSC-certified archival paper, the poster will be a solid gold hit, whether as a decorative high note, or an extended-play exploration of rock history. Printed by Ben Gibson and Patrick Mulligan in Brooklyn, NY. Ships rolled in poster mailer tube. Great for the avid music hound/guitarist! My talented 15-year-old nephew plays the guitar and ukulele. The report from my sister is that he pored over the poster and rearranged equipment in his room to hang the poster in a prominent place! Just what I was looking for. The thing that concerns me is if I am going to be able to get the poster flat. I want to put it in a frame. YouTube has some good demos. This was a present for my son who plays guitar. Purchased this for Father's Day gift for step father. He's retired but loves playing music. He enjoyed the gift. Good quality poster. I actually bought this twice!! I bought this once for a high school graduate- to take away to college with him and then for my father's birthday... both men are guitar enthusiasts and LOVED this!!! Haven't seen this poster anywhere else, and it was the perfect gift for a guitar fan. Ecclectic and engaging for the guitar entusiast! The whole family enjoys looking at the guitars featured on this poster. We all have our favorites, from artsy to funky to just plain crazy! It's also a featured must see when holiday guests visit the house! Wonderful poster for that guitar/bass player in your life. Wonderful color. Excellent weight to frame and hang on any wall. The images are clear and attractive, and the tumblers are good quality.